Originally posted: December 2, 2017 . Last modified: November 5, 2018 . 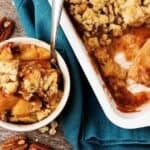 Try our sweet, spiced apple crisp with oatmeal topping recipe for a dessert loaded with Fall flavor, including cinnamon, sugar, and roasted pecans. 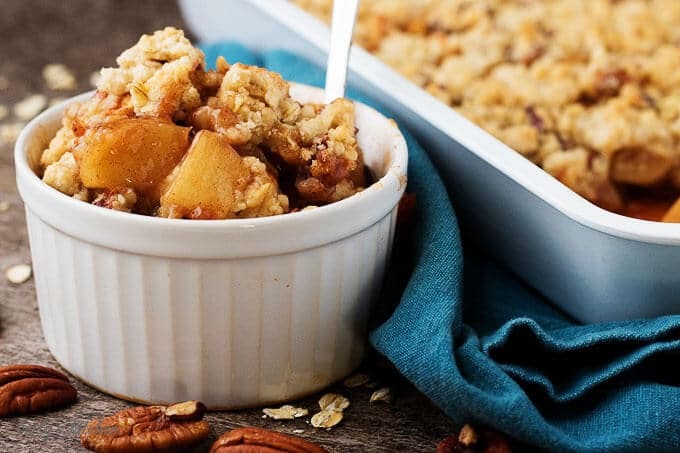 Nothing beats a warm, apple crisp with oatmeal topping for a chilly Fall evening. This happens to be one of my favorite desserts. We’re so excited to share this recipe with you. Let’s get going! Preheat oven to 350 degrees and prepare a 9 x 13-inch baking dish with butter. Toss the diced apples, sugar, cornstarch, apple pie spice, and lemon juice together in a large bowl until the apples are well coated. Pour the mixture into the baking dish in an even layer. Combine the flour, oats, butter, sugars, salt, cinnamon, and pecans in a medium bowl and use a fork (or your hands) to mix until the butter is well combined. 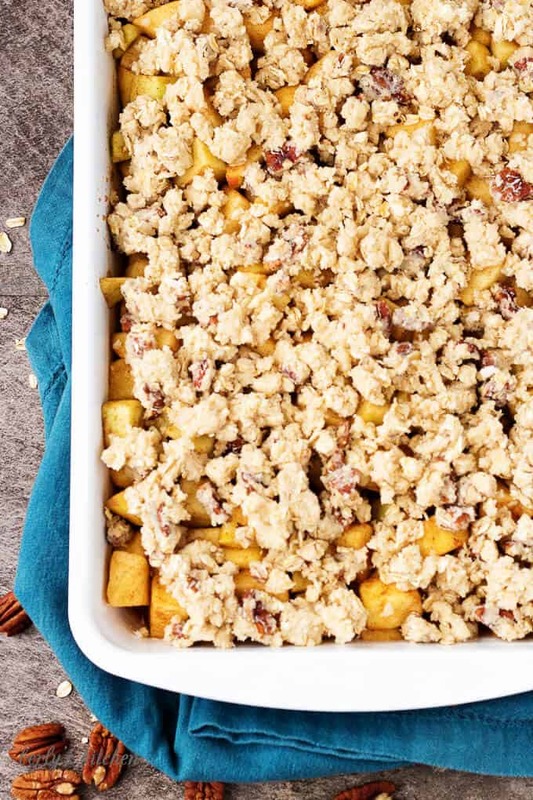 Use your fingers to place pieces of the topping onto the apple mixture in an even layer. There may be areas that aren’t completely covered. Place the crisp in the oven and bake for 35-40 minutes or until the top is golden brown. Remove the crisp from the oven and allow to cool before serving. Store crisp in an airtight container in the refrigerator for up to 3 days. The oatmeal topping should blend together and not be dry or sandy in appearance and should stick together when pressed. There will be areas that aren’t completely covered with the topping. The cooked filling should bubble around the edges. Top crisp with ice cream or whipped topping before serving. 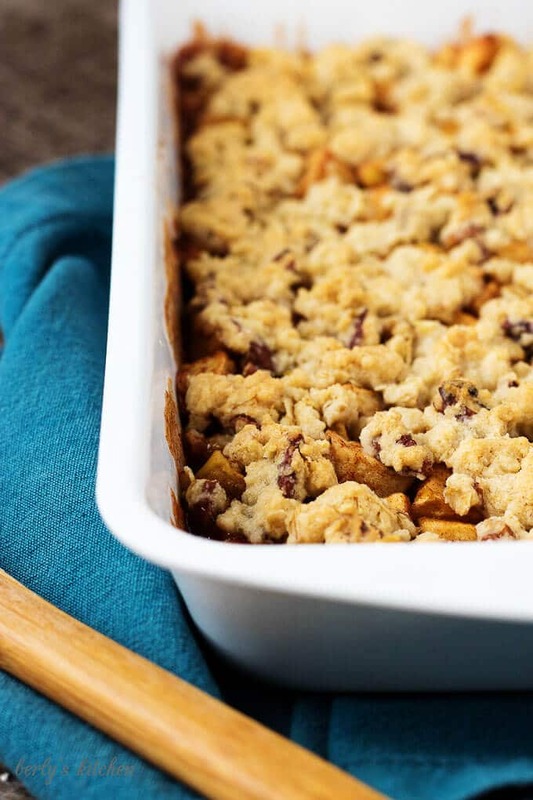 Store any remaining apple crisp with oatmeal topping in an airtight container in the refrigerator for up to 3 days. Mix and match your apples, like Fuji, Granny Smith, and Golden and Delicious. First, preheat your oven to 350 degrees F. and prep a 9x13 inch baking dish with butter. Next, toss the diced apples, sugar, cornstarch, apple pie spice, and lemon juice together in a large bowl until the apples are well coated. Then, pour the mixture into the baking dish in an even layer. 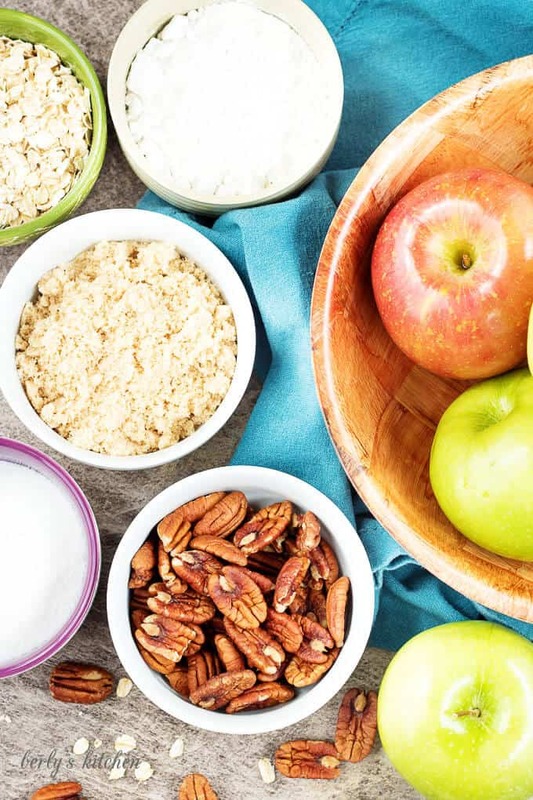 First, combine the flour, oats, butter, sugars, salt, cinnamon, and pecans in a medium bowl and use a fork (or your hands) to mix until the butter is well combined. Next, use your fingers to place pieces of the topping onto the apple mixture in an even layer. There may be areas that aren't completely covered. Place the crisp in the oven and bake for 35-40 minutes or until the top is golden brown. The filling should bubble around the edges. Top with ice cream or whipped topping before serving. Store any remaining crisp in an airtight container in the refrigerator for up to 3 days. The calories listed are an approximation based on the ingredients and a 1/2 cup serving. Actual calories may vary. Top crisp with ice cream or whipped topping before serving. Store any remaining crisp in an airtight container in the refrigerator for up to 3 days. This looks amazing!! I can’t wait to give it a try!